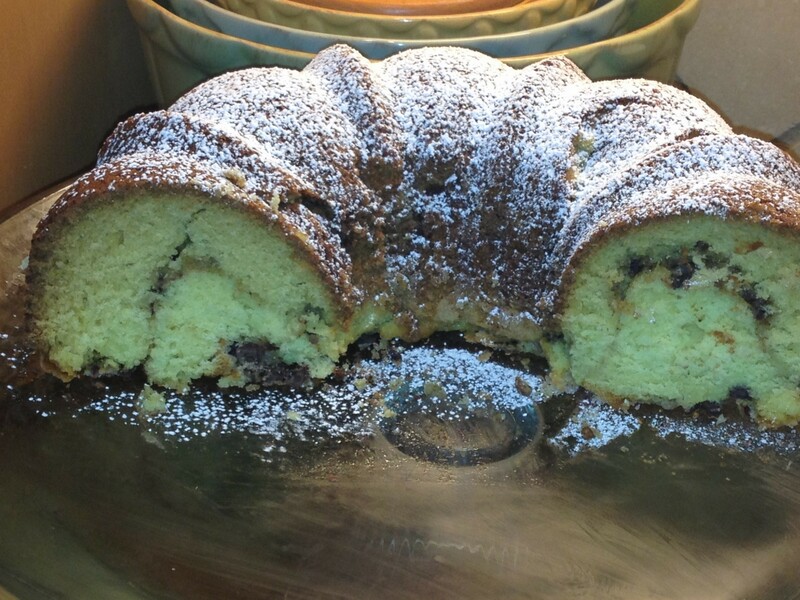 Recently my Cousin Beth shared with me her tried and true coffee cake recipe. She wrote, “This is the first cake I ever learned how to make, and to this day it is my family’s all-time favorite.” I’ve been waiting for an occasion to try it out, and I was expecting a friend for coffee this morning, so I baked it last night. This is cake is so moist and delicious, and it’s the perfect compliment to coffee and company, expected or unexpected. Add sour cream, vanilla and dry ingredients, beginning and ending with flour. Layer 1/2 mixture in a buttered angel food pan (I used a Bundt pan), cover with some topping, add rest of batter, and sprinkle with the remainder of the cinnamon/sugar mixture. Bake for 45 to 55 minutes. This entry was posted in Desserts and tagged coffee cake, sour cream coffee cake, unexpected compay by Mom Mom's Apron. Bookmark the permalink.